State Sen. Don Coram and state Rep. Barbara McLachlan answer questions Saturday during the La Plata County League of Women Voters annual Legislative Lowdown at Durango Public Library. State legislators representing La Plata County solidified their position on gun violence at a community forum Saturday, suggesting that regulations on weapons would not be as effective as addressing the core of the issue: mental health. 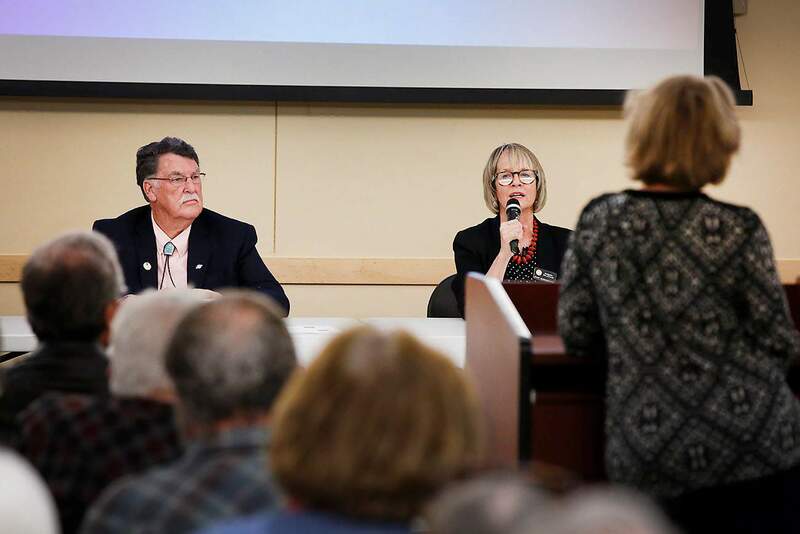 About 100 people attended a La Plata County League of Women Voters annual Legislative Lowdown at Durango Public Library, where community members were invited to ask questions of state Rep. Barbara McLachlan and state Sen. Don Coram in effort to understand their legislative priorities. While the crowd addressed a swath of issues, ranging from LGBTQ issues to oil and gas regulations, a notable group of residents in attendance wore red shirts. Elaine Slade, who lives south of Hesperus, said she wore her red shirt in support of solutions to gun violence. But legislators were careful to couch their responses to questions about gun violence as an issue of mental health rather than an issue of access to weapons. The red flag bill would allow family members, roommates or law enforcement to ask the courts for a “temporary extreme risk protection order,” which would allow the justice system to seize weapons from people who present significant risk to themselves or others. The bill passed the State House on March 4 by a vote of 38 to 25. McLachlan, a Democrat who voted for the red flag bill, echoed Coram’s statements. She doesn’t want to take everyone’s guns, but rather focus more on those who may be a danger to themselves or others. The best way to identify those individuals is through mental health evaluations, she said. Robert Bricca, a nine-year resident of Durango, said he attended the Legislative Lowdown to get a better sense of where legislators stand on various issues he’s interested in, including gun violence, mental health and affordable health care. Bricca said he’s happy to hear that his legislators are taking action on the issues he’s invested in. He’s been to the Legislative Lowdown for the past few years, and he said he’s always impressed by the collaboration between the senator and representative – something particularly special for a pair on either side of the aisle.